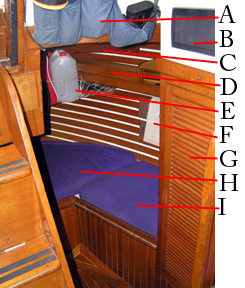 The quarter berth is located down two steps from the NavStation to the port of the companion way steps. This photo gives a view into the space from the galley. With the extra cushion in place this berth is a standard 'Full' sized bed at the top with two people having cozy feet at the bottom. Just above the entrance we have a sunglasses organizer "A" which holds the binoculars, many sets of sunglasses (not being left) and the EPIRB. "B" depicts the Microwave, sitting on the wet locker "G". "C" points to the shelf where the extra cushion lives. "D" is a cleverly hidden and lockable Gun shelf within a book shelf, our shotgun resides here. "E" is our emergency shelf containing the grab bag and a 5 gallon jug of water; these are items we'd grab before jumping into the life raft. Also resident here is the tiller style auto helm (see Ian for details) and backup EPIRB. When underway, we remove the doors as they block the instruments and when required insert companionway boards located at "F". Our usual rule is one slat per reef in the main, but this also depends on point of sail and common sense. Also the stbd cockpit scupper through hull is located here. "I" is also a large locker containing the sea anchor and connecting ropes and chains. If you are not as paranoid as me about having it ready to deploy from the cockpit, the previous owner stored it in the windlass locker and the lines in the port chain locker compartment. Thus giving you an extra storage locker here in the quarter berth. This shows the view from sitting up in bed. To your left at "O" and "P" you have the Refrigeration and Water Maker locations respectively. "M" and "N" provide your cooling being a fan and an Air conditioning outlet. "L" is another view of the grab bag, "K" being the removable shelf and cushion and finally "J" points to an opening hatch, complete with fly screen. Behind your head is a light, an AC outlet and also a phone jack for those marinas with phone connections. When I purchased the boat there was a boat alarm mounted just inside the quarter berth. It is currently in the 4th Drawer by the washing machine. It is fully functional and just needs to be re-wired in. 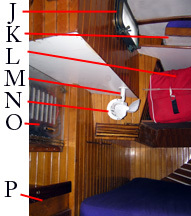 Wiring in notes included in Boat Alarm Details. Have you read Sailing to Jessica?